In the same way that the pediatrician is in charge of controlling the health of the baby until he is a teenager, pediatric dentistry is responsible for his health and oral development. It is very important that the children are treated by a specialist who knows their needs, so that the experience in the dentist is as pleasant as possible. The pediatric dentist is also responsible for giving guidance to pregnant mothers, about the special care they should have in their mouth and that of their future baby. The transmission of bacteria between the parents and the baby, the importance of breastfeeding and the need to brush the teeth from the appearance of the first tooth at 6 months are fundamental issues. At HappyClinica we work with adaptation techniques where we gradually get used to the child’s dental appointment. Depending on the child, more or less adaptation visits will be necessary until we can get dental treatment. There are children who, from the first visit, can start treatment, starting with the simplest, as long as there is no urgency intervention that has more importance. 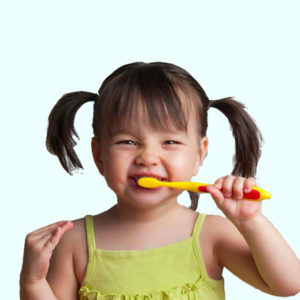 We give priority to prevention, teaching the child to become familiar with oral hygiene techniques, so that from an early age have the habit that will guarantee a good oral health throughout his life. Everything always through play and in a language with which children can understand us. In some cases, bach flowers may be used to treat anxiety. The essential thing is to create a calm and confident environment for the child. It is important that the (family) companion takes this into account as it is easy, without wanting to transmit the child’s own fears. We use biocompatible materials such as composites without bisphenol-A. In cases of generalized demineralizations, or high caries index, it is necessary to make fluoride applications along with minerals. In this case we perform treatments in a topical and controlled manner. At the end of the treatment, the child should attend a check-up at his pediatric dentistry where a control of bacterial plaque accumulation, salivary pH measurement, feeding control and oral hygiene instructions are performed. These controls are important to ensure the child’s oral health. Pediatric dentistry will also detect problems in the development of the jaws and position of the teeth, which if treated by the orthodontist at an early age, will avoid more complex problems in the future. The function makes the shape, so if the chewing, breathing or swallowing are altered will influence the bone development. Among our objectives is the detection and early treatment of any functional alteration that may be impacting on the correct orthofacial development of the child. Let’s try not to pass on our own fears to the child, especially if it is the first time they come to the dentist, let the child have their own experience. Let the child communicate directly with the dr, do not talk for him, let him just answer the questions, and interact. Avoid saying things like “fear”, “pain”, “prick”, “needle”, “blood”, “trauma”. From the second visit, if possible, let the child go alone to the consultation. If the child has to enter accompanied the consultation, that is with a single person. The companion should try to stay seated in his chair, to avoid interfering in the treatment and passage of the auxiliaries. If the dr / dra needs your help, he / she will let you know. If you have questions about the treatment try to resolve them in the first consultation, either before or after treatment, but not when it is being performed. Brush your teeth before entering the office, especially if you have just had a snack, so that you can assess how the quality of hygiene the child is having. If we follow these tips, visits to the dentist will be easier for the child and Dr./Dr.